Strawberry lovers have their tastes. Some love those potent pinkie size Alpine babies. Others of us love big fat hand size juice-down-your-jaw types that you eat when you pick. There are the ones that have berries that arc up and never touch the ground – bug free and clean! And there are those who want their quite firm non messy berries that store a bit better. And strawberries have different shapes, slim conicals to fat and wide, as well as different colors of flowers! June Bearers literally produce in June, intensely, and that’s it! For some gardeners that’s just right. Camarosa, Chandler (high yield, large fruit), Oso Grande, Sweet Charlie, produce lots of runners, so rows quickly become a tangle of plants. The constant new growth and work of production requires regular fertilizer, typically a light feed of liquid fish/kelp every two weeks or so. Day Neutrals make berries any time they can, at right temps. Albion has high yield, large firm fruit, is resistant to verticillium wilt. 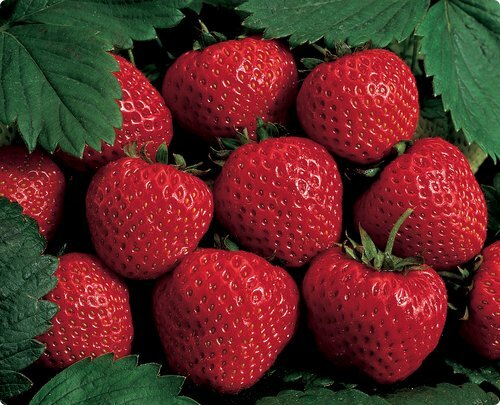 Seascape is very resistant to Strawberry Spot, has high yield of tasty firm large berries all season long. Day Neutrals don’t send out as many runners as June-bearers. Store well. EverBearers produce from spring to fall, whenever the weather is right. Sequoia has large fruit. Everbearers have fewer runners than June bearers. Timing is essential for a productive strawberry crop. Strawberry and onion varieties are region specific, strawberries even more than onions. So plant the varieties our local nurseries carry, or know that you are experimenting! Plant when your local farmers do! 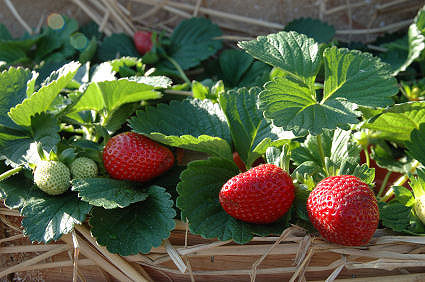 In Santa Barbara CA area, plant your bareroot Albion Strawberries NOV 1 to 5 (get at Island Seed & Feed)! Yes, the Santa Barbara dates are that specific! OR plant bareroot Sequoias December through February. In January you can get healthy bareroot Sequoias at La Sumida Nursery. Plant bareroot Seascapes mid January – get at Terra Sol Garden Center. In areas with cold winters, plant your strawberries early spring as soon as all danger of frost has passed and the ground is dry enough to work. If you squish soil in your fist, it doesn’t drip. In mild winter areas, plant your everbearers in spring so that you can harvest during summer. June-bearing varieties, however, can be planted in late summer or fall for a harvest the following spring. Planting June-bearing strawberries at this time allows them to become productive earlier. If you plant June bearers in spring, they will not start to grow fruit until the next year. Borage and strawberries were made for each other! Borage strengthens their resistance to insects and disease. Some say it improves their flavor! Borage has a good 3’+ diameter footprint, so allow for that. Put it right in the center and plant around it, or at least on the sunny side. If it doesn’t fit in the patch, put it as close to them as possible! Lettuce, spinach and strawberries together are thought to enhances the productivity of all three plants. Spinach contains saponins, which repel “bad guy” insects. Marigold borders discourage pests. If you live where it’s comfy cool to grow blueberries and highbrush cranberries, plant your berries on the sunny side of them. They all thrive in acidic soil. Strawberries are also a companion plant! Plant them as a ground cover to control weeds around horseradish, rhubarb, and asparagus. Clever. NOT Companions! Strawberries stunt the Brassica family: broccoli, broccoflower, Brussels sprouts, cabbage, Chinese broccoli, cauliflower, collard greens, kale, kohlrabi, and Romanesco broccoli. And be careful around Verticillium-Susceptible Species – tomatoes, potatoes, eggplant, peppers, okra, melons or celery. If these plants have been grown in the same spot within 5 years, grow your berries somewhere else. Select a sunny spot where they won’t be shaded by taller plants. If you don’t have such a spot, raise them up. Do containers on a stand, a raised bed, a trellis type device with planting pockets, rain gutters attached to a sunny wall, an upright pallet! Be creative! Plant them in an old wheelbarrow you can move with the sun during the day and the seasons. Hanging baskets are slug free and very pretty! 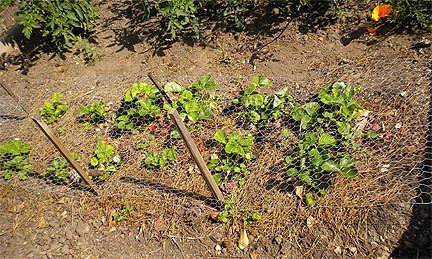 Strawberries are generally planted in an area or a way for convenient picking. Make your patch no wider than an easy arm’s length from either side, or plant as a pretty border plant! Yes, you can plant from seed! Start them in containers indoors about eight weeks before you plan to transplant the strawberries to the garden. They love sun, and rich, moist, well-draining soil. Be careful about the ‘rich’ part. Too rich and you will get all leaf, no berries. Dig the patch deep enough that the roots can go as deep as they want. Bareroot plants start at 5 to 8″ when planted! In nature strawberries grow along the woodland edge in slightly acidic soil. You can make them optimally happy by incorporating some pine needles, stomped cone broken bits or a bagged acidic compost (for azaleas, camellias) into your soil. Those will add water holding capacity but not water log your plants. There are variations of recommendations for planting spacing. 14 to 18 inches apart in rows 2 to 2 1/2 feet apart, OR 18-24 inches apart in rows 3 1/2 feet apart, are two examples.Get bareroot plants in the ground the day you get them if possible. DO NOT LET BareROOTS DRY OUT. If you can’t set them at once, small lots can be kept in good condition in the fridgie. Keep them moist but not waterlogged. To wake them up before planting you can soak the roots 20 mins to a couple hours (not overnight!) in warm water or a diluted seaweed solution. Just the roots, don’t immerse the whole plant. 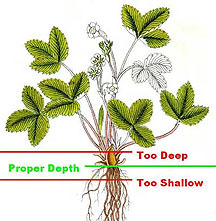 Plant depth and root position are important. You want the crown just above the soil, roots completely covered, stems should be completely exposed. Spread the roots open like a little fan; get them down in the soil, let those little food seekers do their job! Some of your bareroots come with long roots, cut them off about 5 – 6″ long. Remove damaged or bent roots. Dig your planting hole accordingly. Dig down, make a little soil cone at the bottom, spread the roots over it, bury with soil. You don’t want the roots to be bent and remain near the surface where they can dry out. Mulch, when or not? If you live where there are cold snaps, in winter do a deep straw mulch to keep the soil at an even temp. Otherwise, remove mulch so the ground will be warmer. Cooler soil delays flowering. Mulch does conserve moisture in summer, keeps your berries up off the ground out of the munching pest zone – roly polys (sow/pill bugs) and pincher bugs/earwigs, and reduces rot, yes. It certainly doesn’t prevent slugs like many sites say it will. I am merciless with slugs. I use a tad of Sluggo type stuff two or three times, killing off the generations of slugs, and am pest free for almost the rest of the season. If they reappear, do another set of rounds. Plant just close enough so mature plants act as living mulch in summer. When you pick, put still ripening berries up on leaves to keep them clean. Save your back, save the straw. No overhead watering. That spreads the Strawberry Spot disease, those little brown spots. You will read it is only cosmetic, but no, plants that have it don’t thrive, produce smaller and less berries, get more and more sick, eventually die. Leaf to leaf it spreads plant to plant. Remove/replace sick plants. Plant further apart so leaves don’t touch. Be sure your soil is a little acidic – your plant will have more resistance. Get Strawberry Spot disease resistant varieties like Seascape. It has great resistance! Cat faced! Micronutrient deficiencies such as boron, damage to flowers from insects (thrips, mites, tarnished plant bug/TPB aka lygus bug, etc.) and botrytis may cause misshapen fruit. Depending on where you live, with the Lygus bug, it feeds on strawberries when the fruit is very young. The bug overwinters as adults in plant debris and weeds in areas near to your strawberries. Adult females lay their eggs on a number of broadleaf plants including many weeds. After the nymphs hatch, they also spend the winter hiding in plants and debris. Remove debris so they have nowhere to overwinter. Could be your plants might be a tad short on water. Pollination may be a problem if you have rain, it’s too hot or cold, have too much wind and the bees don’t fly. Birds! At least as soon as your berries start blooming, cover them to protect your berries from bird tastings. Some use netting, some aviary wire. Make picking and weeding access easy or you will get grumpy and maybe neglect your plants. Weeding is good. Be sure it is your strawberries that are getting the nutrients. Feeding is good! A grower that started veggie gardening in one of our community gardens had splendid berries he fed every 2 weeks! It was just a bit of fish emulsion in a watering can. But he was regular. He harvested into shoeboxes and had a big smile on his face when he told us how many boxfuls he had gotten each time! He was offered land on a private estate, supplied the estate and went on to sell at the Farmers Market! Northern and cooler clime gardeners, you can extend your season! So can you southern gardeners! Per UK gardener Nic Wilson: If you have an established strawberry patch, now [he wrote in March] is an ideal time to cover some of the plants with a cloche to encourage an earlier harvest (they will crop 7-10 days earlier than uncovered plants). Make sure that you roll up the sides of the cloche when the flowers appear to allow insects to pollinate them. If your plants are in pots or hanging baskets, they can be brought into the greenhouse to achieve the same result as long as insects still have access. With careful choice of cultivars and some crop protection, your strawberry season can begin in May and you’ll still have that summer feeling as you pick the final fruits in October. Berries will produce 2 years, even 3, but production gets less and less. Commercial growers replant every year. So do I! I love strawberries most every day and non organic berries are treated with more pesticides than any other fruit! Grow your own! I also provide the best soil I can so my crop is optimum. Early October I remove my old Seascapes, plant the patch to green manure – Bell beans, Austrian peas, vetch and oats! The legumes produce Nitrogen nodules on their roots to feed themselves. When the plants are tilled in, the Nitrogen becomes available to other plants! The oats grow deep creating channels for air and water and soil organisms. I chop down the mix when the Bell beans (a short variety of fava) bloom. Chop into small pieces and let it sit on the surface for two weeks keeping it moist. Then add acidic compost and a tad of manure and turn it under. Let it decompose in the soil, the soil organisms restore themselves, for 2 to 4 weeks, then plant bareroot mid January! You will have the best crop! Eat ‘em ASAP!!! On average, studies show 2 days as the maximal time for strawberry storage without major loss of vitamin C and polyphenol antioxidants. However, many strawberries never make it to the kitchen. A cup of fresh berries gives 112% of your Vitamin C needs! Not bad. If they are not eaten blissfully immediately, preserve flavor and shelf life by picking into a shallow, paper towel lined container, no more than three or four layers of berries deep. Refrigerate immediately after picking. If you can bear it, or you really do have more than you can eat, give some away to a worthy recipient. Fresh berries, berries and cream or yogurt, puddings, shortcake, cake, scones, ice cream, refrigerator jam, smoothies, strawberry lemonade, on top of pancakes, fresh fruit salad, dipped in chocolate!!! There are so many ways to enjoy your delicious strawberries! January – the Gardening Delight of a New Year! Harvest, Replant, Maintenance, Spring Preps, SEEDS! Keep harvesting! Plant consideringly. That means, summer planting starts in March. January, February are generally cold, so slow growth though day length is getting longer. Keep in mind what space you want available in March for the March starts. If you are a winter plant lover gardener, one way to do this is to plant another round of your favorite winter plants, then in March designate a ‘nursery’ area, and start your summer seeds there. Transplant the babies to their permanent locations as the spaces become available. That in mind, plant more broccoli, cabbage, cauliflower, celery, chard, kale, kohlrabi, potatoes. Plant an understory of all year favorites – beets, carrots, parsley, radish, and turnips, on the sunny sides of taller plants. And LETTUCES! They love January! January IS bareroot month! Start bareroot artichokes, short day globe onions, strawberries (if you missed November), asparagus, horseradish (Be warned! Invasive). Depending on the weather, strawberry flowers may appear shortly after planting. Remove them so more energy goes into root development. Seascape, developed by UC Davis, is an everbearer strawberry that produces well in our moderate coastal climate most of the year. Sequoia is an large berried everbearer; Chandler is a June bearer – produces May/June, then done. For those of you at home, plant bareroot cane berries, blueberries, roses, deciduous fruit trees! Visit Bay Laurel Nursery in Atascadero! Clear overwintering pest habitat, debris; weed. Turn top soil to aerate and let the bad fungi die, pray for the good ones. Sidedress your producing plants lightly – add some fish emulsion with kelp. Sprinkle and lightly dig in cottonseed meal, alfalfa meal or fish meal. Keep a weather watch; keep those old sheets and coverings about in case of hard freezes. Farmers’ Almanac on Frost Weather.com Frost Map Make this one your home page during cold winter months. No mulch this time of year; it keeps the soil cold. Rain Tips! Secure peas and tall plants. If you have been growing favas, time to secure them from winds, rain. Pop in a few stakes and tie them with that green stretchy stuff, or some twine. If they have too much shade, water or fertilizer, they will go to leaf and no bean pods. If that happens, pinch off the growing tips. Take ‘em straight to your kitchen for steaming or stir fry! Back at your garden, side-dress with a sprinkly organic box fertilizer or fish emulsion with kelp, or whatever your choice is, water well! Takes about a week for the beans to appear. Let them get 5 to 8 inches, filled with beans, and their yours – tasty and high in protein! If you are growing for seed, let the pods blacken and dry. Black? Yep, I know, counter intuitive. Make compost, start preparing your soil for spring planting. Make raised beds. Plan your spring garden; get seeds, wait until March to start planting your summer veggies. Wait for it. Plants planted out of season struggle with weather, day length, temps, and are susceptible to pests and diseases they aren’t naturally able to fend off. Now, if you have a greenhouse…. No greenhouse? Start Seeds Indoors – we are now the prerequisite six to eight weeks away from March! Start tomatoes, marigolds, peppers, cosmos, zucchini, impatiens, salvia, basil, and others. Especially start peppers! They take longer than other veggies. Otherwise, wait until all chance of freezing temperatures have passed and buy transplants at your favorite nursery. I’ve seen zucchini started in the ground in January thrive. If it doesn’t come up, no problem! Put some more seeds in soon again! Keep planting. I haven’t seen it work with tomatoes, but Marshall Chrostowski of Pacifica Institute’s Garden starts his toms in January for late March picking! He uses heat transmitting black row covers on the ground, and floating row covers above. That’s clear plastic with holes over hoops. They make the soil 15 degrees warmer, with 15-20% warmer air! You can buy floating row covers at your nursery. Give it a try! Eating garden fresh organic tomatoes late March?! Yum! Row covers will speed up your notorious slow-grower peppers too! Not only do floating row covers warm things up, but they keep flying pests away from your plants! Check out Digital Seed’s Planting Schedule!